In Guymon on any Sunday at Victory Memorial United Methodist Church, you will find ethnic diversity among the worshippers as well as four diverse services. Attendance especially is growing in the Spanish-language service. On Easter Sunday, Associate Pastor Tino Espinoza baptized 13 new Christians and, on the following Sunday, three more. Church members who worship in that service also are showing growth in mission-mindedness, said Gary Holdeman, senior pastor. The group recently hosted a multicultural luncheon of Mexican, Cuban, and Honduran foods. Victory’s wider congregation supported the mission endeavor, which raised more than $1,500. The funds will be used to reach out to the city’s Hispanic population through events designed to invite and welcome more new people. Rev. Espinoza and his wife, Mode, encourage the people to take on leadership roles, and finances are incorporated into Victory’s budget. Spanish-language worship on Sunday begins at 12:30 p.m. Two other services are held at 8:45 and 10:50 a.m. And a growing Ethiopian (Coptic Christian) group also meets at Victory UMC. More than 50 percent of residents in the Panhandle city are Hispanic, according to Census reporting. In Guymon’s schools, 27 languages are spoken, said Superintendent Doug Melton, also a United Methodist. "We are proud of the fruitfulness of our Spanish-speaking congregation," Rev. Holdeman said. 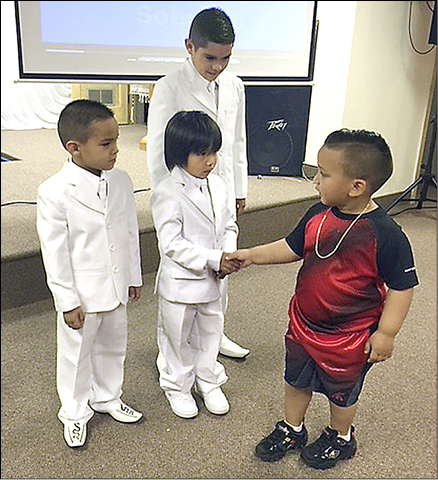 Angel, right, congratulates three newly baptized peers: from left, Isaac, Everado, and Jesse. 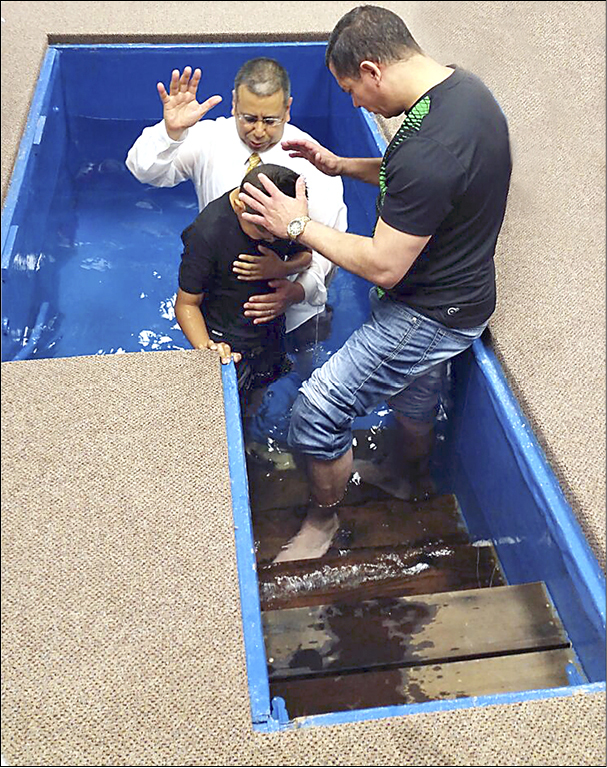 Assisted by Armando Valdes, front, Associate Pastor Tino Espinoza baptizes Jesse on Easter. At the Guymon church, worship in Spanish is held in the Downstairs Fellowship Hall, which features a baptistery.